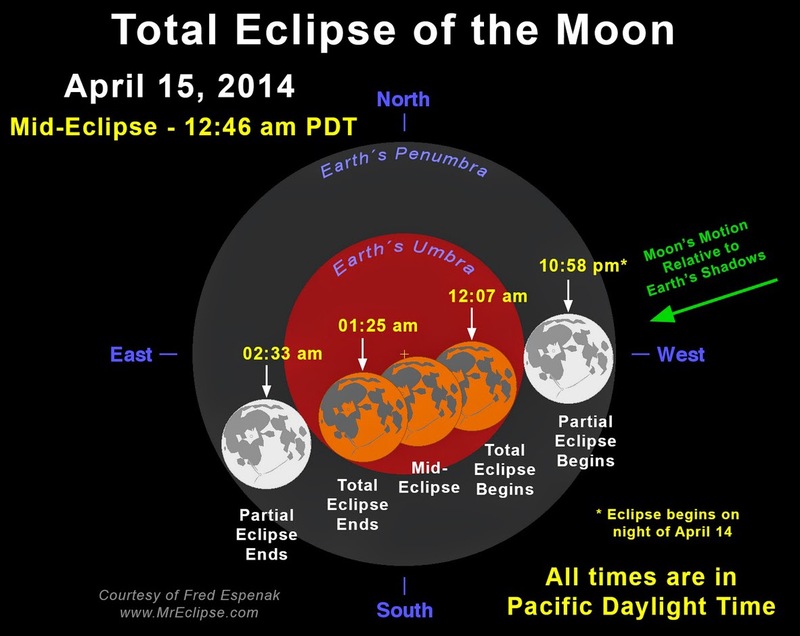 A total lunar eclipse will begin on the evening of April 14 and end during the early morning hours of April 15. During the total lunar eclipse, the moon’s disk can take on a colorful appearance from bright orange, blood red, or possibly dark brown or grey. The event will be visible with the naked eye, but a good pair of binoculars will make viewing a better experience. The Blood Moon takes place when the full moon passes through some portion of Earth’s shadow. In North America, the moon will pass into a shadow region where the Earth blocks all direct sunlight from reaching the moon. The moon will begin to enter the Earth’s shadow at 10:58pm and be fully shadowed by 12:07am. The moon will start coming out of complete shadow at 1:25am.